CRAPTASTIC: Five Feature Friday #4! Phew! This is going up late today! I had an awesome time out on the lake yesterday, but got terribly burnt! Ouch! I look like a lobster! So I came home, showered, and went to bed! Here is one of the cliffs we jumped off of! Terrifying, but exhilirating! I'm that little blob at the bottom left. Oddly enough, I was the first to jump! Very unlike me! Anywho! On to the features!! First up is this awesome secretary makeover from Carrie @ Fine and Handy! The makeover and color selection is fabulous, but the cause is even better! Her sister has been battling breast cancer, and she refinished this for an auction fundraiser for her sister! Go check out her post to see what it's all about! She and her sister are inspiring! Next is this awesome dresser turned TV stand from Camille @ Sugar Baby Boutique. She scored this beauty for $5 and made it her own! Its beautiful!! I'm usually not a big wicker person, but this may sway my opinion! I love what Laura from Design Share did with this set! The color combo is perfect - I love the contrasting fabrics! Beautiful! Rustic Raspberry worked HARD on this beauty! It was all worth it! The little dresser turned out so sweet - love the style, love the color! Isn't the pup cute too! I have an unhealthy obsession with chevron! I was ecstatic when I saw this painted rug from Kari @ The Sunset Lane! She and her hubby have refinished the whole floor - doesn't it look awesome!! I have one more awesome project to share with you guys today! One of my friends found this church pew sitting in the alley in Nashville. She stuffed it in her car and ran with it! 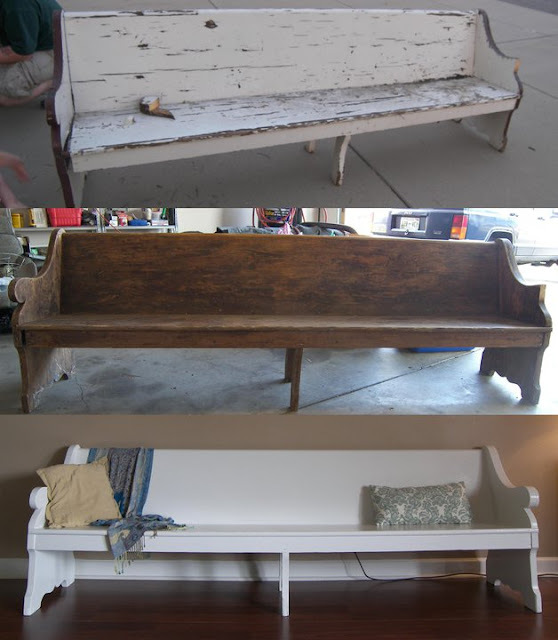 She doesn't have a blog, but I still wanted you guys to see how awesome her pew turned out. Even better, she has a transition photo that takes you from before, to stripped, to after! I hope you all enjoy your weekend! I pack up and head out for Chattanooga Sunday morning. I have no idea what my internet connection will be like while I'm there, but hopefully I will have one! Great picks. Love the chevron and that bench! Pretty features! and, you are pretty brave for jumping off that cliff! There is no way I could have! very cool stuff missy!! Love that pew! Very cool post! Thanks for featuring me! I feel super special. :) I will never regret stuffing that 8 foot pew into my car! Wow! Thank you so so much for featuring me! Thanks so much for featuring my wicker project! 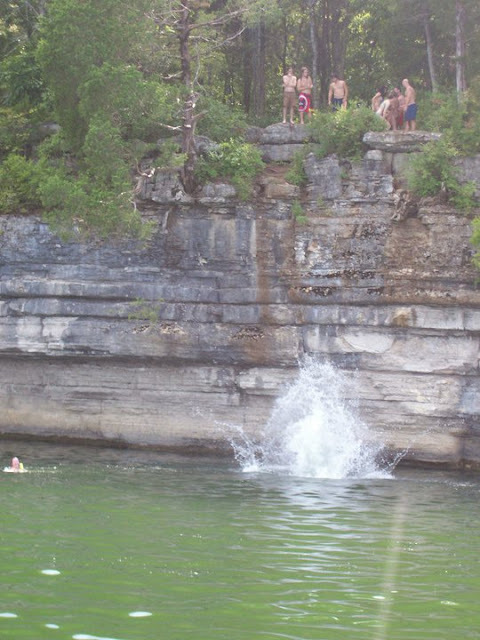 Can't believe you jumped off that cliff!! And had I been in the alley with Ashley when she came across that church pew, I would have totally knocked her over and made off with that bench!! Too cool! That's pretty cool that you just featured Ashley! How long are you going to be in Chattanooga? those are awesome features! going to check them out- love that little desk especially! Kudos on going 1st! I LOVE the tv stand/dresser! !